It is well understood that assessment is an important part of education. What is less agreed upon is what is the appropriate purpose of assessment. In traditional education, assessment is usually linked to the social sorting purpose of education. Specific standards are created in specific subjects and students are tested and scored according to how well they demonstrate that they meet those standards. 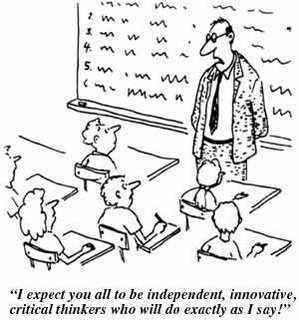 This is philosophically consistent with the teacher-centered traditionalist approach to teaching. However, assessment must change not only its form but also its affect to match the philosophical needs of constructivist education. Constructivist education is about the students constructing their own knowledge. Progress towards the learning goals needs to be measured generously and in support of each child’s success. This has two specific implications. First, the measures of success need to be changed. Rather than tracking performance as if education was a contest, performance needs to be tracked in terms of the student’s proximity to success. Rather than the traditional “Proficient,” “Advanced,” “Below Basic,” etc., more student centered assessment results should be used. “Not there yet,” “On Target,” and “Above and Beyond” captures the intent of the assessment more clearly. Second, constructivist education believes that every child should succeed and therefore assessment results should support that belief. Constructivist assessments are there to discover what a child has mastered and in what areas further work is needed. That is how the results should be presented and the affect they should carry. Constructivist assessments must always be in support of the child’s learning. This all has implications for grading. It hardly makes sense to hold an expectation of each child’s success and then rank him or her on a scale of 0 to 100. A teacher standing apart, ranking her students, destroys the emotional foundation of constructivism. Like the assessments themselves, summative results should reflect broad learning outcomes like “Not Quite There,” “On the Mark,” and “Above and Beyond.” Written or verbal assessment should emphasize both the student’s successes and areas where collective effort needs to be made to achieve learning goals. It is critical that the student is seen as the creator of his or her learning and that the teacher is seen to be in complete support of that achievement. Implementing constructivism in a modern classroom is challenging and assessment policy is among the biggest challenges. On the other hand, a classroom in which assessment is fully constructionist will true the entire classroom culture to constructivism and ease that challenge.